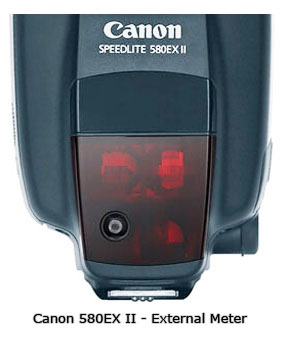 Why would you want a Canon Speedlite 580EX II? It's a high-end flash gun suitable for the professional as well as the serious hobbyist. It is powerful, versatile and comes along with the correspondingly high-end price tag. If you need to have an abundance of creative control with your lighting or you want to give yourself a reward for your hard work, the the Canon 580EX II is a good choice. The 580EX was a great speedlite and it was the first Canon flash I ever purchased. Very early on in my photography career I used the ever-popular and affordable Vivitar 285 and 285 HV and actually shot a few weddings using them. I later graduated to the several professional Quantum flash systems before digital photography changed everything. Canon really nailed it when they made a few significant changes to the original when the 580EX II evolved. One big change from the 580EX to 580EX II was made in how it mounts to your camera. The rotating locking screw shown below, was replaced by a locking lever. The ridged wheel on the original 580EX pictured above is nice and big and is definitely better than some of the units I've used over the past few decades. 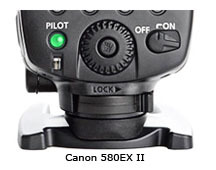 The Canon Speedlite 580EX II pictured below takes the shoe mount system to a new level. It's a huge deal in the grand scheme of things, but it is one of those little changes that add up and give you, the Canon user, a better experience. One simple motion and your speedlite is fastened securely to the hot shoe, the locking pin is lowered and the metal contacts make good solid connection for the flow of information between camera and accessory. There is also a lock release button on the right for quick removal.I love this feature for two reasons. It is quicker and who doesn't like that? Secondly, you won't guess which way to turn the screw and you won't over or under tighten. 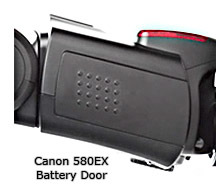 I never had any problems with the battery door on my 580EX, but I always felt like I had to be extra cautious to prevent it from breaking. The cover slides downward and then hinges sideways but the swinging motion was not smooth at all. 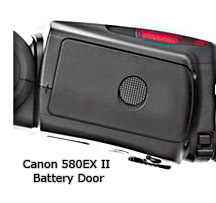 Perhaps not a big deal since I usually used a Quantum Turbo Battery as the power source anyway, but the battery door on the speedlite 580EX II is a nice upgrade in design and function. It's a simple sideways slide of the button, then a downward slide of the door and it swings upward, out of the way for an easy battery change. The batteries are arranged in a 2 x 2 pattern instead of the normal staggered orientation. 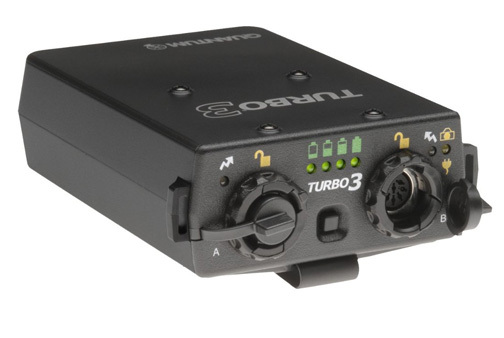 This flash gun also rotates and tilts with the push of only one button. It rotates 180 degrees side to side and it can tilt downward a few degrees as well as upward as high as 90 degrees. 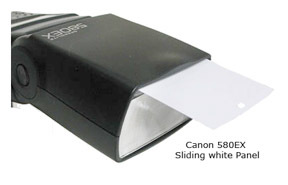 It also has a very handy white panel that can be easily slid out to have a small portion of your flash go directly toward your subject from just above the camera. This gives you great lighting for closer subjects as well as a "catch light" highlight in the eyes when you are doing people photography. Canon Camera designed the 580EX II to match the dust and water resistance characteristics and the body strength of its Canon 5D Mark III. This as the first flash gun that Canon did this with and it's a big plus for outdoor photography. Photographers that shoot events in rain or near water will love is feature. Canon also built better communication reliability through direct contacts and 20% faster recycling time which is also completely silent. This feature can be used to give you automatic exposure when your flash is not on your camera and triggered by a third party slave such as the PocketWizard. It will also work well in those situations where you are using your Canon 580EX II as a regular slave flash. Accessory speedlite flashes such as the Canon Speedlite 580EX II are some of the most valuable gadgets you can have in your camera bag. The improvements to the already-advanced and feature-full original 580EX make the Canon Speedlite 580EX II one of the most powerful and valuable camera accessories you can find. 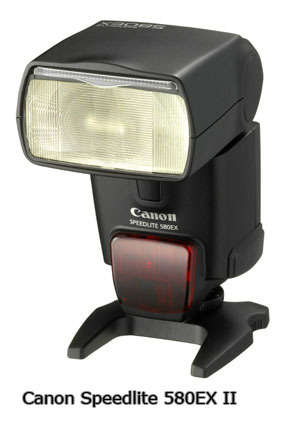 You may also be interested in the Best Canon Speedlite Accessory for the 580EX II. Please consider using one of the retailers below when you make your purchase. It helps me keep the Canon Geek site going and it cost you NOTHING.